(CNN) -- Did the tech news ever stop this year? Here, in no particular order, are 10 of the top tech stories and trends we'll remember from 2010. When the new year dawned, almost no one in the world knew what an iPad was. Outside of the techno-geek community, few had even heard of tablet computers -- the hybrid, missing link between smartphones and laptops. Then in late January, that all changed. With theunveiling of Apple's much-anticipated tablet computer, Apple didn't invent tablet computing. But the gang from Cupertino, California, certainly pushed it into the mainstream. Now, 13 million or so sales later, the Apple gadget is at the top of the list of gadgets that children 6 to 12 want to see under the tree this year, according to Nielsen research. And it's starting to get some company. In a field of tablets running Google's Android operating system, the Samsung Galaxy has emerged as the iPad's chief rival. Early this month, Samsung said that the tab had sold 1 million units since its launch in October. And Research In Motion, the makers of BlackBerry, plan to join the battle early next year with the Playbook, which they're already touting as being more efficient than the iPad. Tablets don't have the computing heft of slightly larger laptops or the pocket-size storage of a smartphone. But their video, gaming, Web-surfing and media-consumption abilities are capturing a big audience and it's a safe bet they're here to stay. A major Hollywood movie. A Time magazine "Person of the Year" nod for its CEO. And a half-billion users, more or less. Oh yeah ... and it passed Google to become the Web's most-visited site. Facebook passed Google this year to become the Web's most-visited site. If Facebook was already a force of internet nature on New Year's Day, it became a phenomenon unmatched in Web history in 2010. 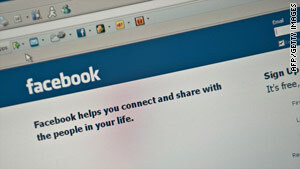 The rise of Facebook was the subject of Aaron Sorkin's "The Social Network," which has grossed more than $90 million. It also was a key element of the lesser-known, but arguably more intriguing, "Catfish." Some tech bloggers predicted the unflinching and often-fictionalized movie would hurt founder and CEO Mark Zuckerberg's reputation. Instead, he seems to have been catapulted to an even higher level of celebrity. Of course the billions of dollars he's donating to charity didn't hurt. In September, Zuckerberg -- who, at 26, has an estimated net worth of $6.9 billion -- pledged $100 million to Newark, New Jersey, schools. Then he trumped that this month with a pledge to donate more than half his wealth to charities during, or after, his lifetime. In 2009, the concept of mobile check-in apps was just emerging. In 2010, it took off. Growing with the rising number of smartphones, social apps such as Foursquare and Gowalla creeped out of the tiny cloister of the tech elite and into the mainstream. "Check-in" mobile apps went to another level in 2010. Foursquare, which has emerged as the leader in the field, saw dramatic growth in 2010. In March, Foursquare CEO Dennis Crowley celebrated the app hitting the half-million-user mark. This month, it surpassed 5 million. Networking giant Facebook liked what it saw. In August, they launched Facebook Places, a similar check-in feature. The concept of checking in at bars, restaurants and other spots appeals mainly to a young, social crowd, and, in the minds of some, raises privacy concerns. But a spate of apps for homebodies followed in 2010. Mobile apps such as GetGlue, Miso and Philo let users check in to TV shows, movies, books and other entertainment, earning virtual and sometimes real-word rewards along the way. Other apps offer similar rewards for visiting websites, meaning users don't have to leave their desks to play. According to Crowley, one of the goals of such apps is to turn the whole world into a game. Most Web users haven't signed on yet, but the number of those who have keeps on growing. The way we play video games began what could be a seismic shift in 2010. And there were no paddles or joysticks involved. 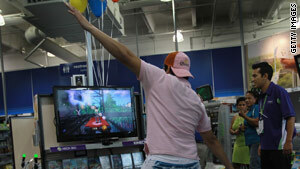 Microsoft's Kinect system for the Xbox 360 took the greatest leap forward. Rolled out at the E3 video-game expo in June, the Kinect is totally hands-free, using a camera to read the player's movements and incorporate them in the game. Microsoft's Kinect system uses a camera to read the player's movements and incorporate them into the game. From tickling tiger cubs to controlling Harry Potter, Kinect gets gamers off the sofa and immersing themselves in their game worlds. Apparently, it's catching on. The Kinect system sold 2.5 million units in its first month on shelves and is on pace to sell 5 million by the end of the holiday season, Microsoft said. Not to be outdone, Sony rolled out its Move system for the PlayStation 3. Utilizing remote controllers that look a bit like glowing ice-cream cones, Move isn't quite hands-free, but boasts what developers say is superior motion-sensing. And then there's Nintendo. The pioneers of motion-based gaming stood pat on the hardware this year, but pressed its early advantage by rolling out more complex, fully-imagined games such as "Metroid: Other M," "Disney: Epic Mickey" and "GoldenEye 007." Tech-savvy couch potatoes have been rigging their networks to push Web content onto their televisions for a while. But in 2010, some of the biggest names in technology, as well as some savvy upstarts, got into the Web TV game in a big way. At the front of the pack? Google and Apple. 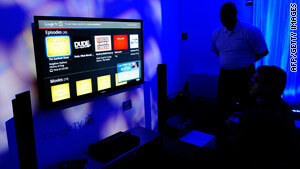 Google TV launched this year and struck deals with HBO, Pandora and Netflix. Apple TV was launched in 2007, but it mostly languished until it got a reboot and a major price cut in September. In addition to Netflix integration, the system lets users buy TV shows for 99 cents each. Google has promised a similar system -- optimizing Web sites for TV and striking deals with the likes of HBO, Pandora and Netflix. Google TV has hit some snags. Several major networks aren't playing along, and The New York Times recently reported that it needs more time than expected to work on software. Meanwhile, companies such as Roku and Boxee are offering similar devices, suggesting that Web TV, in one form or another, is here to stay. Oh, iPhone 4. Rarely has the launch of a gadget provided more suspense or entertainment than Apple's June unveiling of the latest in its popular smartphone line. First things first. The phone has been a hit, selling millions of units. First, there was the riveting saga of the beer-hall iPhone. After an Apple employee reportedly left a prototype, disguised as an iPhone 3GS, at a California beer garden in April, someone snagged it. 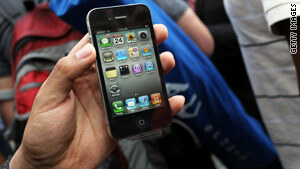 The iPhone 4 was unveiled in June, but there were some complaints about its reception strength. Then, tech blog Gizmodo paid $5,000 to get its hands on it and published an article and video under the headline, "This is Apple's new iPhone." Police raids, bitter recriminations and the phone's eventual return followed. And that was all before the thing was even released. Perhaps the most unkind cut came when Consumer Reports, which declined to recommend the phone because of the reception, suggested slapping a piece of duct tape onto the sleek and shiny piece of tech. Apple, with CEO Steve Jobs as point person, denied there was a major problem with the reception, even during a subsequent news conference where they offered free cases to cover up the spot where a "death grip" caused the phone's signal to weaken. Over time and a handful of software updates, the complaints faded and talk of the iPhone 4 turned to features such as its FaceTime video chat, high-resolution screen and ultrathin design. But it was a wild ride. Speaking of smartphones, 2010 was when that space got really interesting. No longer was the iPhone able to just go head-to-head with the stalwart workhorse of the gadget world, the BlackBerry. A new phone running Google's Android system seemed to pop up every week. The Droid II. The Droid X. The HTC Evo and the Samsung Galaxy S were just a few. In fact, Android phones outsold iPhones during the first half of the year and, with several new releases, will no doubt keep up that pace through year's end. In October, computing giant Microsoft officially got into the game, announcing a pile of different phones that would run its Windows Phone 7 operating system. And with its Bold and Torch phones, BlackBerry has embraced the touchscreen phone world, hoping to meld the security and efficiency that professionals crave with some of the iPhone's fun. The app-store model pioneered by Apple for its phones took off in a big way in 2010. Obviously, Apple rolled out a new online store for apps for the iPad. But it followed with a bigger surprise later -- announcing that an app store for Macs will open in January. In October, the Android apps store broke the 100,000 mark. That's still far fewer apps than Apple offers, but it showed that the model was growing steadily. And in December, Google announced it was opening an app store for its Chrome browser as well. It's certainly been a paradigm shift in how computer programs are purchased. And, we suspect, its really just a secret plot by "Angry Birds" to take over the world. Online privacy has been a hot topic on the Web for a while. But this year, it seemed to constantly be in the news. (You know, the kind of news that CNN did a whole series about). The more time we spend online, the more of a digital footprint we leave. And should someone savvy be so inclined, the easier it becomes to track that print. On Facebook, every new change seemed to bring privacy concerns. Whether it was the Facebook Places feature, which lets users tell others where a friend is, or changes in users' default settings that sparked enough backlash to lead Facebook to adjust its privacy controls, the site was clearly home base for people concerned about having their information stolen, sold or otherwise used without their permission. Privacy concerns cropped up again late in the year when Gawker's sites were hacked and users' e-mails and passwords were accessed. 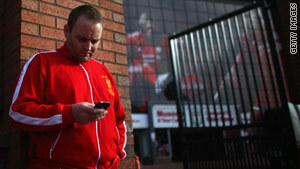 Other users expressed security fears about sharing their locations on Foursquare and other similar services. Net neutrality was a buzzword in tech circles for most of the year. But it came to a head late in December when the Federal Communications Commission adopted a set of rules to guide Web usage. The new rules, by the way, did not seem to make anyone happy. Internet-freedom advocates wanted stronger protections that would guarantee service providers won't be able to pick and choose which content (oh, say, their own) gets delivered quickest and which lags behind. They also fear big businesses and wealthy individuals will one day be able to pay for better service than everybody else. Supporters, including President Obama, say the news rules address that, but advocates aren't fully convinced. Then there are the critics, mainly Republicans, who think the FCC shouldn't have gotten involved in business on the Web at all. The final chapter on this one hasn't been written. The regulations will almost certainly be challenged in court. And if they survive, January will see the GOP take control of the U.S. House and strengthen its minority in the Senate, meaning the whole plan could get blown to bits by new legislation.